The oddest chance meeting with someone can spur us on to so much more, much like the Domino or Butterfly Effect. This is precisely the path that unfolded for documentary filmmaker, Aubrey Aloysius after having met and interviewed live on stage the youngest daughter-in-law of Lal Bahadur Shastri, Neera Shastri at an event called ‘A Musical Memorial – Remembering Mahatma Gandhi and Lal Bahadur Shastri’. 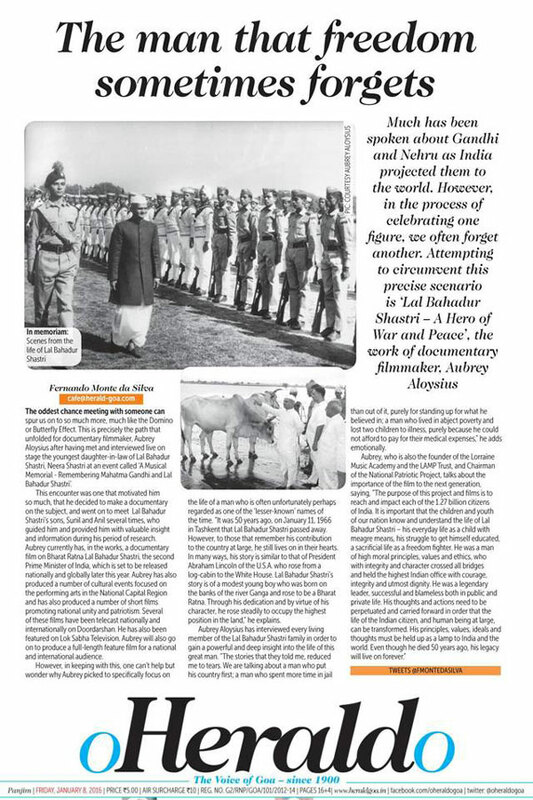 This encounter was one that motivated him so much, that he decided to make a documentary on the subject, and went on to meet Lal Bahadur Shastri’s sons, Sunil and Anil several times, who guided him and provided him with valuable insight and information during his period of research. Aubrey currently has, in the works, a documentary film on Bharat Ratna Lal Bahadur Shastri, the second Prime Minister of India, which is set to be released nationally and globally later this year. Aubrey has also produced a number of cultural events focused on the performing arts in the National Capital Region and has also produced a number of short films promoting national unity and patriotism. Several of these films have been telecast nationally and internationally on Doordarshan. He has also been featured on Lok Sabha Television. Aubrey will also go on to produce a full-length feature film for a national and international audience. However, in keeping with this, one can’t help but wonder why Aubrey picked to specifically focus on the life of a man who is often unfortunately perhaps regarded as one of the ‘lesser-known’ names of the time. “It was 50 years ago, on January 11, 1966 in Tashkent that Lal Bahadur Shastri passed away. However, to those that remember his contribution to the country at large, he still lives on in their hearts. In many ways, his story is similar to that of President Abraham Lincoln of the U.S.A. who rose from a log-cabin to the White House. Lal Bahadur Shastri’s story is of a modest young boy who was born on the banks of the river Ganga and rose to be a Bharat Ratna. Through his dedication and by virtue of his character, he rose steadily to occupy the highest position in the land,” he explains. Aubrey Aloysius has interviewed every living member of the Lal Bahadur Shastri family in order to gain a powerful and deep insight into the life of this great man. “The stories that they told me, reduced me to tears. We are talking about a man who put his country first; a man who spent more time in jail than out of it, purely for standing up for what he believed in; a man who lived in abject poverty and lost two children to illness, purely because he could not afford to pay for their medical expenses,” he adds emotionally.